The Pasque flower, Anemone pulsatilla is one of the most Thursday 11th spectacular of the flowers you will April find on the Heath. Around Eastertime the best surviving concentration of this plant in Britain can be seen flowering on Church Hill, accessed via Fox Covert on Therfield Heath. They are currently out in bloom, and they provided the inspiration for our front covers this month from local photographer Bex Iles. April also marks the start of marathon season and we’re proud to share details of many of our local inspirational runners who are running - including our very own Sharon who is undertaking her second London marathon in aid of GOSH. Our #TLMs focus on the great outdoors and Springtime pursuits, as the weather is getting nicer and the evenings getting longer we hope that you too are able to find the time to enjoy all that our local area has to offer. Keep an eye out for out team mentions and let us know how you’ll be making the most of your Spring. As we are heading into Spring and the weather is starting to look brighter our #TLM’s this month are focusing on Spring Activites. We are sharing some of our favourite ways to spend time outdoors and making the most of the Spring season. Spending just a little time outdoors is great for the mind. Even if you feel like you haven’t got the time, which sometimes is hard to do in our busy lives, stepping away for a while is hugely benefical. There are plenty of parks around Royston and the Villages, these are perfect for even just an hour outdoors. Priory Memorial Gardens in Royston gives you the option to bring the children and have fun in the park or sit on the grass just to relax. With the splash park due to open in the Summer it makes for a perfect (free!) day out. Wimpole Estate is another gorgeous outdoor space just down the road from us. You can walk the grounds for free, or the gardens are well worth a visit, and for the energetic people amongst us, join in with the Park Runs taking place at the weekends. 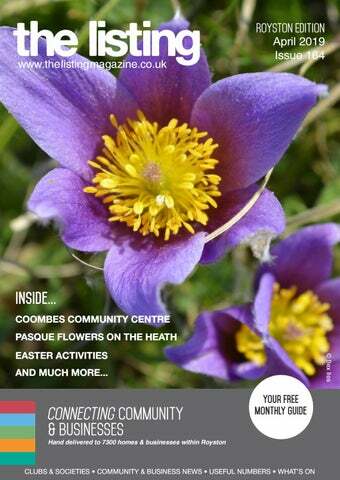 Of course we couldn’t go without mentioning the beautiful outdoor space we have in Therfield Heath, and with the blooming of the Pasque Flowers in April it is a must visit in the Spring, whether you go on the walk, use the Heath for outdoor sports or walking your little furry friends. If you are finding it hard to step away make use of your own garden. From gardening to sitting outside with a drink, all is beneficial to the mind and soul. Look out for our team mentions throughout the magazine. Royston Cave reopens for summer Royston Cave is reopening for a brand new season! In the company of our expert guides, take an unmissable tour and explore this unique, world famous heritage site. Learn about the cave’s secret past and delve into the mysterious world of the Templars. Royston Cave is an enigma. No records of its age or purpose exist. Some theories suggest it was used by the Knights Templar, others by King James I and the Freemasons. Discovered by accident in 1742, Royston Cave has continued to baffle visitors for centuries. Man-made and beehive shaped; the cave is cut 25ft into the chalk that underlies Royston’s ancient crossroad, Ermine Street and Icknield Way. Some suggest it is also the site where two ley-lines meet. It is believed that the ley-lines are a powerful source of healing energy and that the cave has been a sacred site for thousands of years. The cave contains an extensive range of wall carvings representing the Crucifixion, the Holy Family and several saints including St Katherine, St Laurence and St Christopher. Elsewhere are figures of a horse and an Earth Goddess, believed to be Pagan symbols for fertility. Beside the carvings, the cave was found containing a human skull and fragments of a drinking vessel. 20th April - 28th September Open every Saturday, Sunday and Bank Holiday (including Wednesdays in August). For tour times, ticket prices and visitor information visit www.roystoncave.co.uk. Visit our website to ﬁnd out 20 Good Reasons to Join our Team! VALUE TO YOUR HOME A fireplace is at the very heart of a room. It radiates a warmth, comfort and style that is unparalleled and creates an inviting and 90x60 homely ambience. Spring clean? it’s that time again! First impressions are always important. Whether you are reflecting the existing style and period of your home or creating a brand new image, Trulight has the answer. Our doors are fitted with security locking systems as standard. All doors have been designed with security in mind all round - not just the lock. You can rest assured that your door will resist the most persistent uninvited guests. Our speaker this month was Frances Benton who spoke about “A Passion for Pearls”. Her love of pearls began in childhood when she was given her grandma’s necklace. After retiring Frances started a business producing jewellery. Frances lives in France for 6 months of the year and for the rest tours the UK giving talks. We learnt that there are three types of pearls. These are natural pearls, which are rare and expensive. Cultured pearls, which are, produced on farms, are real pearls but reasonably priced. Simulated pearls are much cheaper.Frances had a display of necklaces, earrings and brooches for sale. She donated all profits to charities and has raised over £55,000. News from the conservators It was great to host over 70 pupils from Greneway School on March 12th, in what can best be described as awful weather. They walked across much of the eastern side of the site, visiting an assortment of historic monuments (including the oldest one in Hertfordshire) while hearing about subjects as diverse as what we are trying to do to protect ground nesting birds and the fascinating relationship between ants and chalkhill blue butterflies. Please remember that keeping yourself and your dog on pathways at all times will help the ground nesting birds be successful. We ask dogs to be on leads in certain areas because they are the areas where dogs tend to cause the most problems. Please help us look after these declining bird species across the nature reserve while they are trying to breed. you may inadvertently step on buds that are waiting to open. The public meeting is now planned for 23rd May to open up discussion on car parking, dog walking and the Byelaws which have not been updated since 1989. We have created a new dog exercise area between the Golf & Sports Club to encourage the exercise of dogs here instead of on the Rugby pitches were the constant issue of dog faeces has been causing a great deal of concern and extra work, so we hope people will use it. Spring is in the air, and it’s already feeling like summer is on its way with the lighter mornings and evenings! For me April is very outdoorsy full of fitness, preparing myself for London Marathon and our covers this month have inspired me to take lots of walks over the Heath to see the stunning Pasque flowers which, the majority of the time will involve a circular walk via The Heath Café and Fox and Duck pub, It’s too hard to resist this time of year! And the Heath does have one of the best beer gardens around with amazing views of the sunsets and sunrises! • Dental care and extractions We are approachable, sympathetic, understanding and helpful - we will listen. We clean your oven...so you don’t have to. Hate cleaning, but would love a clean oven? Sally Stone is the proud owner of Homemade @ The Barn in Bassingbourn. The Barn has over 35 unique sellers selling a huge variety of beautiful upcycled, vintage, retro, and handmade items which make for glorious gifts and presents, stunning home accessories or even just treats for yourself. Find out a bit more about Sally and the lady behind the business: Where do you live? I have lived in Wrestlingworth village for nine years and love the community and my friends. Tell us about your business? I setup Homemade @ The Barn on 23rd June 2018, I rent space to 37 people who either hand craft items from felt key bowls to wooden clocks and knitted hats or some people sell vintage, retro or just simply second time around. by beautiful things created by talented people! Best thing that has happened to you recently? There are many amazing things that have happened in my life, jumping free fall out of a plane from 15,000 feet, travelling round India and Australia, diving with sharks, to name but a few but working for myself hits the top spot as its been a dream for so long. Also, getting my son on the school bus by himself, thats such a big step for him, I feel it deserves a mention What are you looking forward to most this month? I’m really looking forward to Easter. I love everything it represents, the giving of new life, new beginnings, spring and babies and not forgetting family and food. Having my own business is bloomin’ awesome! I cannot describe how I feel, knowing that I have created this beautiful space. What has been the most valuable life lesson that you have learnt? My most valuable lessons learnt are to be patient, only worry about the things you can change, if it’s out of your control, just let it go. Don’t forget, everyone has the right to be who they want to be, to express themselves and their opinion, and to dress as they wish! My proudest moment would be giving birth to my son - with no pain relief! He 07730 496225 or 07387 100455 makes me happy everyday. Life is hard as homemadeatthebarn@gmail.com he is autistic, but we muddle through one www.homemadeatthebarn.co.uk day at a time. Royston Historical Pageant Step back in time to the middle ages and enjoy free entertainment for the entire family at the Royston Historical Pageant, taking place in the Priory Memorial Gardens, Sunday 7th July 10am to 5pm. mummers plays; medieval dance, music and story telling; falconry and archery. Royston photographic society An exhibition of beautiful photographs are currently on proud display at The Royston Museum. David and Debra run a Family Tree Research business. The accompanying photo is a scan of a tintype or ferrotype image produced in 1892. We have three of these plates of Great Grandfather Edward Cater taken at the seaside. This is the third of the series that includes their first two children. had similar businesses, and his sons became Cater Brothers, who pioneered Supermarkets in the 1960’s and 70’s. From Tallulah’s Kitchen Lemon Polenta Cake Hello my fellow foodies... and welcome to another bright and shiny edition of The Listing. This month I would like to share with you a fresh and zingy lemon cake it is the perfect antidote to all those Chocolate Easter Eggs - if it is indeed possible to have too much chocolate? Coincidentally, this cake happens to be gluten free so happily it is safe for celiacs although it is made with almonds so to be avoided by people with nut allergies. 45 minutes to an hour until the mixture has risen slightly and is golden brown in colour. While the cake is cooking zest 2 of the lemons and juice the remaining 3 and half lemons. Add this to the 80g of caster sugar and heat enough only to dissolve the sugar. When you remove the cake from the oven prick the surface all over the cake and pour the lemon juice mixture all over the cake and let it soak in, there may seem to be too much liquid but, trust me, it will soak in! Leave to cool in the tin then store in an airtight container until it is needed. Simple chicken, but made very special with an RSPCA Freedom Food chicken from Suffolk. Roast with garlic and lemon for an Easter weekend treat and serve with the first new potatoes and lots of fresh vegetables. Delicious! If you run a market in the SG8 area please let us know and we can include in next issue! Mexican and Italian street-food has arrived on Royston Market! Occasions for Less Established in Royston 43 years. A destination shop for outfits for Mother of the Bride and Groom. 12 - 5pm Sunday 28th April with free entrance and parking entrance via Newmarket Road SG8 9NE. Enquires for suppliers wanting a stand please call 07912 866606 and booking enquires for Burloes Hall 07792 910971 viewings prior the wedding exhibition strictly by appointment for more information on Burloes Hall please go to the website www.burloeshallweddings.co.uk or email info@burloeshallweddings.co.uk. We have a wide selection of items suitable for all events from a small party in your home, a birthday party in your garden, fete and fun days, weddings and all celebrations. We are a family-run business and can provide all items manned by experienced qualified operators. Do visit our website to see some of our selection and give us a call or send us an email if you have a speciďŹ c requirement, we are always happy to provide a quote. We are the home of the infamous Greenhorne Rodeo bull, the best bull this side of Texas. We are a family-run business and safe fun is our motto. Hire us for that special party, wedding, corporate fun days, group events and celebrations. Do give us a call or send us an email to discuss your requirements and we can prvide a free quote. ke design service, to create one-off designed by you. e watches (buy, sell & part exchange) & clock repairs, including battery es, replacement straps, full servicing & ng. ons for insurance & probate purposes. olding four valuation days throughout this year, by appointment only. Established in 2013 & situated at 8 high street Royston. HC Jewellers Repair Café Get ready for summer! & Gold Buying Centre are a family session Spluttering lawnmower, wonky run jewellers who offer quality wheelbarrow, garden table with Coombes jewellery at competitive prices with Included on your Community a loose leg, silent strimmer? a professional & friendly service. certiﬁcates, are Don’t wait to check your sheds Centre Including... On Saturday evening On the evening, Stephen detailed reports and garages for broken items Sunday 4th May, Khandel will tell us more about 28th April 10am-1pm • A vast range of brand new silver & digital photos of your valuable in need of attention. Volunteer light will be delighted their story whilst we sip our broken item now items, for insurance or probate. and gold jewellery, modern & Book in your the next complimentary Royston torepairers welcome at Stephen Pinkster traditional designs. for a free Dates include: Repairfounder Café session are Fever-Tree having tonic andassessment and, Marsh, of with • Pre-loved jewellery, all quality 6th June, where possible a fix at a special focus on helping you Pinkster Gin, to host of course a raspberry and checked & refurbished. 17th July, www.repaircafe21.eventbrite.co.uk aget veryready special Gin some fresh mint. After this for the summer. • Wedding & Engagement rings 26th September, Tasting event to be we will be invited to taste can be made to order with an 27th Novemberheld in the Shooting Room on the beautiful various gins and learn extensive range of designs. Cockenach Estate near Barkway. first hand about what If you would like an appointment • Bespoke design service, to dates, or about when the Barley based makes a great gin. create one-off pieces designed for any of the above Pinkster all came have any questions & need advice by you. founder realised wine and beer no longer Khandel light continues regarding your agreed jewellery, feel freeA keen maker of sloe liqueurs to help improve the lives of some of the most with him. • Prestige watches to call 01763 244705 or come in and other concoctions, he turned his attention impoverished people on earth, with water, buy, sell & part exchange) store. (If you are unavailable on to spirits and started experimenting at home, education and more recently the worlds first • Watch & clock repairs, including the valuation days, let us know mashing assorted fruits with different spirit women’s parliament, which is already helping to battery changes, replacement so that we can make alternative elevate and strengthen women’s status. straps, full servicing & cleaning. arrangments forstrengths. you). • Valuations for insurance & He wasn’t intentionally creating a pink drink, it’s Tickets are £20 including a complimentary We also purchase probate purposes. just unwanted that after working his way through an entire drink, the gin tasting and canapés. If you palladium, fruit bowl, raspberry delivered the best flavour. would like to join us contact Bridget Gough We are holding four valuation days gold, silver, platinum, precious stones, vintage But it was & always his intention to develop a gin on 07815 846447 or Richard Bland on throughout the rest of this year, by prestige watches. that could accompany food, which is where the 07976 788565. All proceeds to Khandel light. appointment only. flavourCentre, profile of Pinkster kicks in. Visit khandel-light.co.uk for more information. HC Jewellers & gentle Gold Buying Our valuer is a member of the 8 High Street, Royston, SG8 9AG Institute of independent valuers 01763 244705 & will be available on these days, www.hcjewellers.co.uk to assess jewellery & watches. IS TICKLED On Saturday evening 4th May, Khandel light will be delighted to welcome Stephen Marsh, founder of Pinkster Gin, to host a very special Gin Tasting event to be held in the Shooting Room on the beautiful Cockenach Estate near Barkway. Pinkster all came about when the Barley based founder realised wine and beer no longer agreed with him. A keen maker of sloe liqueurs and other concoctions, he turned his attention to spirits and started experimenting at home, mashing assorted fruits with different spirit strengths. He wasn’t intentionally creating a pink drink, it’s just that after working his way through an entire fruit bowl, raspberry delivered the best flavour. But it was always his intention to develop a gin that could accompany food, which is where the gentle flavour profile of Pinkster kicks in. raspberry and some fresh mint. After this we will be invited to taste various gins and learn first hand about what makes a great gin. Khandel light continues to help improve the lives of some of the most impoverished people on earth, with water, education and more recently the worlds first women’s parliament, which is already helping to elevate and strengthen women’s status. For more events please visit our website Email your events to lucy@townhousepublishing.co.uk for them to appear on our website and printed in the month of the event (subject to space). Wed 3rd & Wed 10th Apr, 12 - 1.30pm St. Thomas’s Catholic Church Hall, 6 Melbourn Rd, Royston SG8 7DB All welcome. Wed 10th Apr, 10 - 11.30am & 12 - 3pm Wandlebury Country Park, CB22 3AE Vital Spark Theatre is a Cambridgeshire-based company specialising in working with young people in a creative way through drama, dance, music and creative arts. Bookings: katherine@vitalsparktheatre.org. Thu 11th Apr, 7.30pm Royston Methodist Church, SG8 7AU Joe Daintrey will use some portable lighting units and the aid of some members of the audience to illustrate how lighting plays a very important part in theatre and film, having the power to enhance or degrade its subject. Everyone welcome – EldonThursday. Sun 14th Apr, 3.30 - 5.30pm Royston Methodist Church, SG8 7AU The theme for March is “Easter”. Adults and accompanied children of all ages are welcome to come enjoy creative crafts, science experiments, a short celebration service and a meal shared together. Wed 17th Apr, 10am – 3pm Whaddon Village Park, SG8 5FQ Buy a wristband and bounce all day! Hosted by A10 Country Bouncy Castles. For children up to 12 years. Under 5s £5, over 5s £7. Fri 19th Apr, 9.30am Royston Methodist Church, SG8 7AU Followed by the Walk of Witness to Royston Cross. Fri 19th - Mon 22nd Apr, 10am – 4pm Wimpole Estate Royston, SG8 0BW Bring the whole family together this Easter and explore our naturethemed Cadbury’s Easter Egg Hunt at Wimpole. Normal admission charge applies plus £2.50 charge per trail booklet. Windows on Easter – reflections on the story of Easter Fri 19th Apr, 1.30 - 4pm Melbourn Baptist Church, SG8 6DB Open-air music and thoughts at 1.30pm. Craft activities, refreshments and Easter windows from 2 - 4pm. Sat 20th Apr, 10am – 12.30pm Market Hill, Royston Find the 12 chocolate rabbits hidden in shop windows around Royston town. Names drawn at 12.30pm by the Mayor. Thu 25th Apr, 7.30pm Royston Methodist Church, SG8 7AU Joan & Ray Munden will take you on a journey from the Great Pyramid of Giza to the Temple of Isis at Philae, from still, dreamy mornings to a hot afternoon sandstorm, and tell you about some ancient history and contemporary Egyptian life. Sun 28th Apr, 10am – 5pm Steeple Village Hall, SG8 0NQ Admission Free. Tea, Coffee and Cakes. Artisan Crafts and produce, including handmade Jewellery, Paintings, Textiles, Knitwear and much more. Every Sunday, 10 – 11am Wimpole Estate Royston, SG8 0BW Weekly free 2k timed run for 4-14 year olds. www.parkrun.org.uk Mon 8th, Thurs 11th, Mon 15th and Thurs 18th April, 12 - 1.30pm The Old Bull, 56 High St, SG8 9AW Are you finding it hard to afford the extra meals during holidays? Bring kids for lunch and fun. Free. No questions asked. Do Your Carpets or Upholstery Need Cleaning? We are a local cleaning company maintaining a high standard of service and a friendly manner. We Will Professionally Clean Your Carpets And Upholstery. We Offer Stain Removal, Protectors And A Full Cleaning Service. Please Call For A Free Quote or Advice. All Types Domestic & Commercial Work Undertaken. Real Ales, Live Music and more. Royston Town FC’s Beer Festival is back in May! Entry £2.50 adults, kids go free! Everyone is welcome. Enjoy beer from local breweries in Potton, Milton and Lord Conrad and Russell’s Cider from Potton. Cloudy2Clear is a leading local glass replacement company, established for over 10 years. By saving your window we can... SAVE money, SAVE energy, SAVE time. The good news is you don’t need to go through the expensive process of replacing the whole frame. You can just replace the glass. Our quotes on average take no longer than 20 minutes. becomes less obvious. The shape of the flower beds can then be used to manipulate the journey. A well-positioned larger plant will encourage you to want to look beyond it and experience what is round the corner. The position of borders are helping to indicate the journey on the lawn and through the space. Perhaps the top of a pergola can be seen beyond the planting or the sound of water is pulling you along to find out. If the path is very obvious then the experience of working out the journey is quite different. Atmosphere can be created by the clever use of paths in a garden design. I recently designed a garden using red brick pavers that meandered around the edge of a lawn on one side and a deep border on the other. The path material not only tied in with the old property in style and colour, but the atmosphere of rustic and informal curves helped bring the design together. The journey under foot may have been firm but the feeling was gentle and relaxed. Had I designed a straight line from one entertaining patio to another at the top of the garden with sawn edged granite planks the effect would have created a very different atmosphere. It is important to consider the style you aspire to when designing a garden as the material selection can be used to develop the theme. Very contemporary material are in conflict with the design style of rural rustic charm. Whereas large square porcelain pieces laid to continue the outside-inside living style create a very contemporary look. Come and visit our friendly team for expert advice! Extensive outdoor plant area plus two large glasshouses bursting with: Seasonal perennials Homegrown plants Trees & Shrubs Seeds Gardening equipment Bedding plants ...and much more! nORTH hERTS aRTS sOCIETY North Herts Arts Society brings people together through a shared curiosity for the arts. The events provide welcoming places to hear expert lecturers share their specialist knowledge about the arts. Members contribute to and preserve our artistic heritage through volunteering and grants.Our work creates a better, healthier and more connected society. royston explorer scouts needs you! Do like outdoor adventures, increasing your skill set or looking to give back to your community? Our 14-18 year olds need you! If you are interested please do get in touch for more information, leaders must be 19+ and will need to undergo a DBS/CRB check as well as safeguarding training. We offer flexible volunteering so a weekly commitment is not always necessary. We have 3 units, Mondays in Barley, Tuesdays in Royston and Wednesdays in Harston all three units run a full and varied programme. We are working hard www.roystonscouts.org.uk/ to provide exciting opportunities become-aand helping gain awards like the leader/ Duke of Edinburgh as well as preparing them for the future with cooking, first aid and much more. I love Spring because it gets me so excited for the Summer, so much goes on in the Spring and with the flowers starting to bloom it’s a perfect time to spend outdoors. On my lunch breaks when the weather is nice I’ll tend to take my lunch into Priory Gardens for a bit of fresh air. This Spring I want to make the most of the time outdoors so let me know of any suggestions of where to visit! Have you ever wanted to learn to run? Get Active and Royston Runners have teamed up to teach you how to run with people of similar ability. The 10 week course starts Wednesday 3rd April 6.30pm. First off, I would like to say thank-you to those who read our item in February Listing and attended our Valentine Disco as a result. It proved to be a great success. Royston Mencap welcomes all disabilities and all ages and an annual subscription of £15 entitles all members and their carer/parent/guardian to attend various events and outings during the year. Reflexology is a gentle but firm foot massage. It’s deeply relaxing and works on the belief that specific areas of the feet relate to individual parts of the body. Reflexology is regarded by many as a potent method of mitigating the physical and emotional stresses of our complex modern lives. Clients frequently report that Reflexology simply makes them “feel well”. The treatment is relaxing, calming and 01763 245736 07779 269822 generally leaves the client feeling less stressed, happier www.soleintentions.co.uk and restored to a sense of well enquiries@soleintentions.co.uk being. They’ve got their trainers on for Khandel light! Khandel light have six runners in the London Marathon this April. Two of the Gough family are running again, Bridget Gough, a veteran of more than a decade of London Marathons and a founder member of the charity, is running with her son Rich. Taking part again is John Adamson, a Royston man who has run for the charity for several years. New runners Charlie Brooke Barnett, Seb Noller and Dan Scott join the team this year. Khandel light continues to work in Rajasthan, providing water, education, supporting employment, offering training and empowering the progress and development of young women. needed a lot of care. Bliss provided support to my family during this time. I’m raising money so that they can continue to support families like mine. On April 6th I’ll be running the South Downs Way 50 mile ultra-marathon. This is the furthest I’ve ever run, probably the furthest I will ever run in one day! I am very fortunate to be running the London Marathon through the ballot entry and I have chosen to raise money for Garden House Hospice Care. My Grandad was diagnosed with IPF over 10 years ago and over time his condition progressively worsened. During the last year of my Grandads life, the Garden House Hospice was there for him and my family. Spring to me is a time of new growth, new beginnings. January – March can be tough, dark months and I always approach this time of year with caution, planning and filling my time with a variety of activities that make my heart sing. The arrival of Spring marks a new lightness – longer days, lighter evenings, the warmth of the sun on our skin and the new shoots pushing up through the ground. The beauty and certainty of our natural world is there to be celebrated in Spring. Richard’s Monthly Tip Train with your partner. Couples who train together are more supportive of each other. This is put down to the mutual respect generated by working out together. You are also less likely to quit if you have someone else to train with. Business contacts are important – networking should be a key part of any SME’s marketing. If like me you find it hard to begin conversations in a room of strangers, here are some useful opening lines I’ve gathered. so difficult. But plenty of people start conversations with me like this. Don’t overthink it, just offer a hand to shake and say the words (then shut up and listen)! “How’s business?” • Great in business circles – we all like talking about ourselves. My tip is to answer positively and truthfully – and never invent success stories, they have a habit of finding you out “Crumbs! I hate networking.” • This is how I started! I’d see someone else standing miserably in the corner, so I’d walk up and start a conversation about our mutual lack of desire to chat to strangers. It often led to all sorts of interesting introductions! And once you begin a conversation, ask more questions than you answer. It’s ironic, but people find you much more interesting if you let them talk about themselves! Let me know how you get on! We offer a FREE initial appointment to discuss your circumstances, offering advice on Wills including ring-fencing your home from care and guidance regarding Inheritance Tax Nil Rate Bands. HOME VISITS are available at NO EXTRA CHARGE within a 20-mile Radius of Royston. FREE WILL SERVICE for the over 55’s through the Cancer Research Free Will Scheme. We have been building long term relationships with our clients for over 40 years, providing expert financial advice: Pensions | Investments | Life Cover | Tax Planning Contact KDW’s Adviser Gary Cretton, based in Litlington, to discuss your planning: E: gary.cretton@kdw.co.uk | M: 07703 692 773 PAST PERFORMANCE IS NOT NECESSARILY A GUIDE TO FUTURE PERFORMANCE. THE VALUE OF INVESTMENTS AND THE INCOME FROM THEM CAN FALL AS WELL AS WELL AS RISE AND YOU MAY NOT GET BACK THE AMOUNT ORIGINALLY INVESTED. KDW is a trading style of K D Wright Financial Services Ltd which is authorised and regulated by the Financial Conduct Authority. Registration No: 509886. Useful Numbers can also be found online at www.thelistingmagazine.co.uk in The Listing Directory Need to update your details? At Ivett & Reed we specialise in creating the kind of distinctive fireplaces which add style, warmth and value to your home. We have an extensive range of fireplaces designed to suit any room and style – from the most contemporay to the most traditional. All our fireplaces are custom made by our highly skilled craftsmen using only the finest quality materials sourced from all over the world. 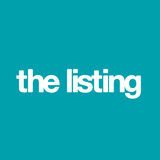 The Listing is probably the most professional and comprehensive business and community magazine in Hertfordshire. To celebrate the life of someone special, you want the very best. Ivett & Reed has been producing headstones, cremation and commemorative plaques for East Anglian parishes since 1896, delivering service with sensitivity. A fireplace is at the very heart of a room. It radiates a warmth, comfort and style that is unparalleled and creates an inviting and homely ambience.